Discussion in 'News and Current Affairs' started by ghazi52, Apr 30, 2015. CHARSADDA: At least two, including a police official were killed on Thursday when former interior minister Aftab Sherpao’s convoy came under a suicide attack in the Umarzai town of Charsadda district of Khyber-Pakhtunkhwa. 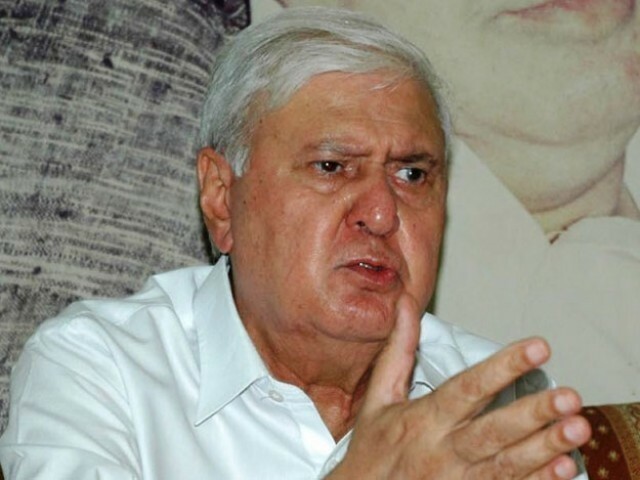 According to officials and eyewitnesses, Sherpao was attacked as soon as he left the venue of a public meeting. He remained safe in the attack. When the suicide bomber tried coming close to Sherpao, police officials shot him dead. However, the explosives attached to his body detonated. Three people were also injured in the attack, and their condition is said to be critical. The public meeting was arranged in connection with the death anniversary of former MPA of the party, Alamzeb Umarzai. Besides Aftab Ahmad Khan, his son Sikandar Hayat Sherpao and MPA Arshad Umarzai also addressed the public meeting. This is the fourth attack on Sherpao in recent years. Prime Minister Nawaz Sharif has strongly condemned the suicide attack on Sherpao’s convoy, Radio Pakistan reported. In a statement, he extended condolences to the family of the deceased police official and sought a report of the incident.